KSJ bushings have been developed by ČZ company including the technology of their production in order to avoid the increased chain elongation during the first running distance, which is known at the chains with standard bushings. The chains with KSJ bushings reduce their extension during the operation and substantially increase the possible number of travelled kilometres. This represents the elimination of frequent chain adjustment for the users. ​The top performances of current motorcycles are no problem for new range of SDZZ chains. High static strength and durability of the chains SDZZ represent an ideal and safe choice for motorcycles with highest output. A special production technology of KSJ bushings and by computer optimized shape of the plates enable to increase the number of running distance also at extreme load. Patented sealing Active-ring minimizes the frictional resistance during the operation to the lowest value in its category. The company ČZ uses a rotating method of pin riveting on its motorcycle chains over a long period. The reason of it is an extraordinarily strong connection of the pin and outer plate. 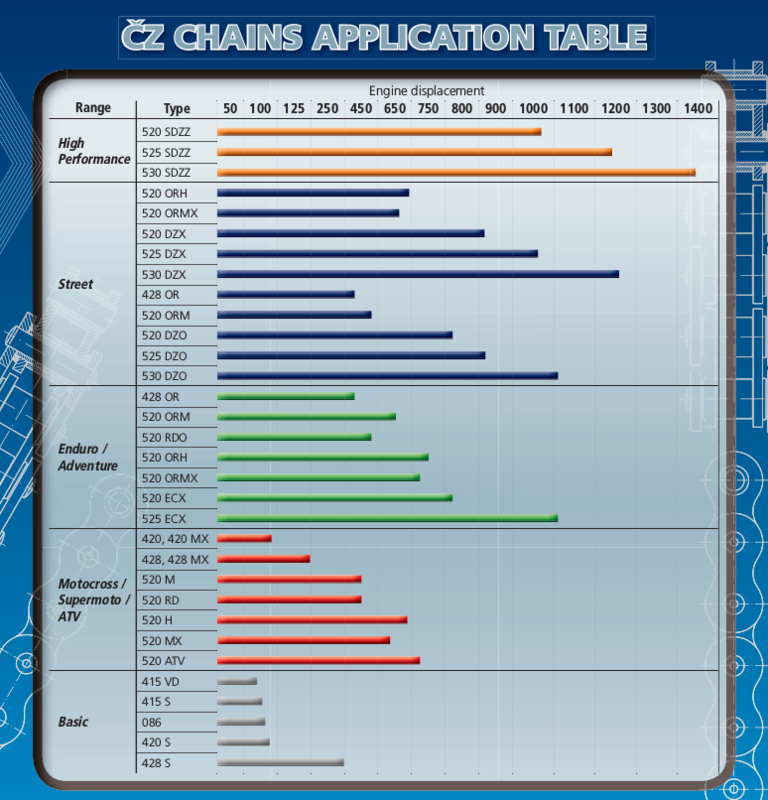 Like this the CZ chains reach 10% added strength over other manufacturers. Active Ring is a sealing ring especially designed for a small frictional resistance and stable sealing power. The shape of the ring ensures elasticity and possibility to seal up the grease in the chain also including the standard sealing edges running wear. The O-rings assembled in the cheaper types of chain types have higher frictional resistance and smaller ability to seal up the grease. See the application guide for indication as to which chain you may require for your bike. You can also view this pdf document which lists all common bikes and the standard chain sizes.